I don’t often review outdoor gear on this blog, but in light of the new ‘words – mountains – imagination’ tagline I am going to be broadening my horizons a little. I hope my readers who are into the great outdoors find these articles interesting. Since childhood, I’ve mainly worn boots on my feet while exploring the outdoors. You know the sort of boots I mean: big, clomping, probably made of dinosaur leather and chunks of meteorite. Accepted wisdom was that the rougher the terrain, the heavier the boots you needed. I bought into the ‘ankle support’ thing and never thought another world might exist. About six years ago, my perspective changed. A friend introduced me to 5.10 Guide Tennies: lightweight, flexible, minimalist approach shoes designed for fast mountain travel and easy rock climbing. I wore the things on every summer day trip in the Scottish mountains for about two years, until they wore out. But I was wary of using trail shoes for backpacking. 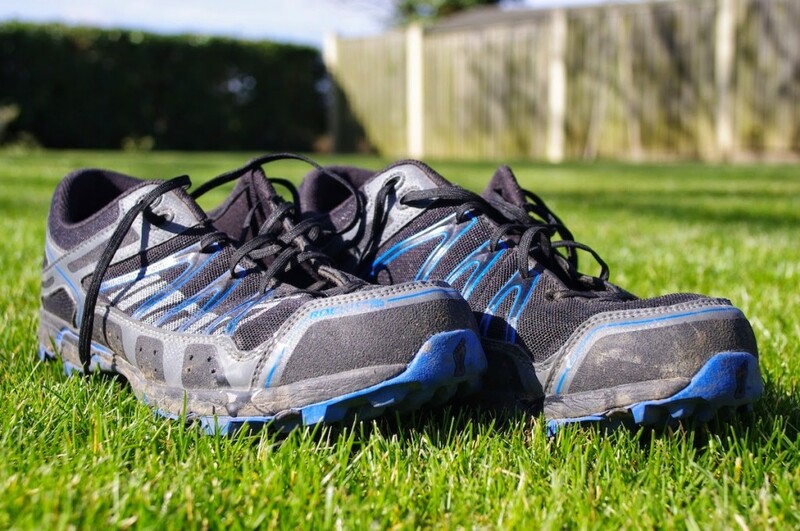 I thought carrying a heavier load might require more ankle support than Guide Tennies offered — until, that is, June 2013 when I found myself walking part of the Blair Atholl – Aviemore route in Scarpa Zen Pro trail shoes. The increase in comfort was amazing, and I didn’t suffer from blisters as I often do when wearing big boots. My Scarpas are starting to wear out. This summer I intend to thru-hike the Cape Wrath Trail, so I asked for advice online about the best footwear to use. 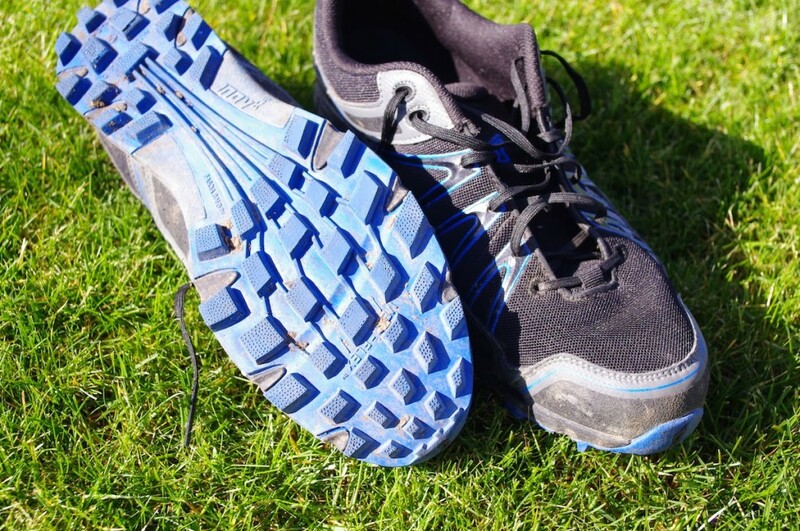 The response was almost unanimous: get a pair of Inov-8 Roclite 295s. These shoes are light. They weigh in at about 300g, depending on size, and they’re much less robust in construction than my Scarpas (which are actually more like minimalist, low-cut boots). In fact, they’re light enough to make me a little concerned about durability, but it’s obvious that a pair of shoes like this aren’t going to last as long as a pair of B1 hiking boots; the question is, is that a price worth paying? They felt incredibly comfortable when I tried them on in the shop. I was impressed by the level of ventilation allowed by the mesh uppers; I could actually feel the airflow across my toes, which was a positive sign after years of backpacking in hot, uncomfortable boots. My toes had far more room to wiggle and move around than I was used to but my heel was held firmly in place. The soles are made of a softer material than the Vibram rubber I’m used to, but the grip is very aggressive and specifically designed for mountain use. Another concern I had was water ingress. 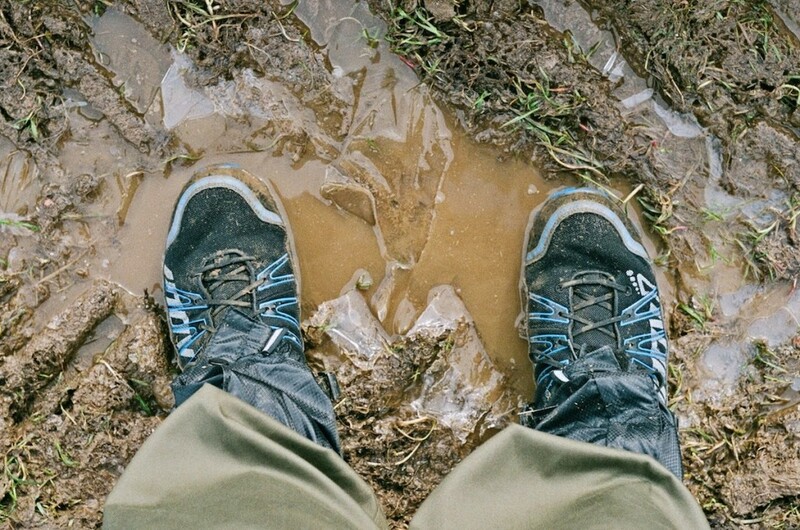 Footwear for backpacking is all about compromise between keeping water out and getting the shoe dry again afterwards. Even if you choose fully waterproof boots, water will always get in after a few days of hiking in wet weather — and when it does, those boots take ages to dry. I can attest to this from long experience! If you choose lightweight, quick-drying footwear, you have to accept the fact that your feet will be wet some of the time. The Roclite 295 sits at this end of the scale. They make no attempt whatsoever to keep the water out; in fact, they welcome it in, but promise to dry just as quickly. I was interested to test this new approach. The first step in the assessment of these shoes was to walk a few miles in them. Nothing too taxing at first: just five miles through the local fields. I decided to swap out the stock footbeds for my Superfeet Blues, which I have worn in all my hiking footwear since 2010. I decided to stomp through as many ice-encrusted muddy puddles as possible. At first it was a shock! Water poured straight through the mesh uppers in a way that my Scarpa trail shoes had never allowed. However, within two minutes of walking through frozen puddles, my feet felt warm again and I could feel the water being pumped back out. I walked the five miles with wet feet but felt far more comfortable than I would have done wearing big boots in similar conditions. When I got back home, the shoes were extremely muddy both inside and out. I cleaned them under the tap with an old toothbrush, reflecting that cleaning out the silt would be vital under similar conditions while backpacking, to avoid sediment rubbing against skin and causing blisters. However, in practice it’s highly unlikely that you’ll be forced to walk through such continuously oozy terrain for long distances; it’s almost always possible to pick a different path. And, after all, wading through burns will do a lot of that washing-out for you. I realised that the Superfeet were not the best insoles for these shoes. They’re quite rigid, and didn’t allow my feet to flex as much as they should have done. I decided it was better to use the minimalist footbeds that came with the Roclites. Nevertheless, things were looking good. My next step was to take a slightly longer walk, this time in dry conditions. I selected a fifteen-mile hike through the Lincolnshire Wolds on a sunny day. The hike was a pleasure. The shoes were continuously comfortable; it felt like hiking in slippers, and my feet never got too hot. Wearing boots in similar temperatures is always uncomfortable, because my feet tend to overheat and blister. It just wasn’t a concern on that day. I didn’t even feel any soreness under the balls of my feet. After fifteen miles, it felt like I had hiked about five in big boots. How did the footbeds perform? Impressions were mixed. 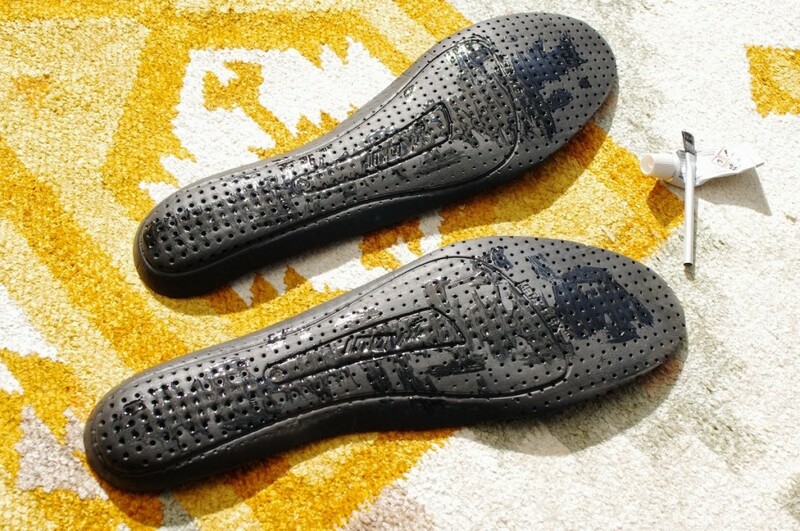 On the positive side, the thinner footbeds allowed more natural foot movement and were very comfortable. On the other hand, I don’t think they fitted very well in the shoe, and both of them ‘drifted’ a little towards the heel — the left one by about an inch, leaving a gap under my toes. I had to stop twice to sort this out, which is unacceptable on a hike of such modest length. The footbeds are clearly not the right size for the shoes. Rather than going back to the Superfeet, or looking for another pair of insoles to fit, I decided to adopt a more DIY solution. Seamgrip to the rescue! I don’t want to stick them down permanently as this will make the shoes more difficult to dry out, but dry Seamgrip is very sticky so should provide enough grip. Overall, my first impressions of these shoes are extremely positive. They’re lightweight, comfortable, and keep my feet cool and blister-free. They’re grippy enough for mountain use and comfortable in the wettest, coldest conditions. My only ongoing concern is durability; will they last the two hundred miles of the Cape Wrath Trail? I don’t know, but I’m beginning to think that durability is a sacrifice worth making for trail shoes this good. I’ll be sure to write up a more thorough review after I have tested these shoes to their limit on the long and rough miles of the Western Highlands.